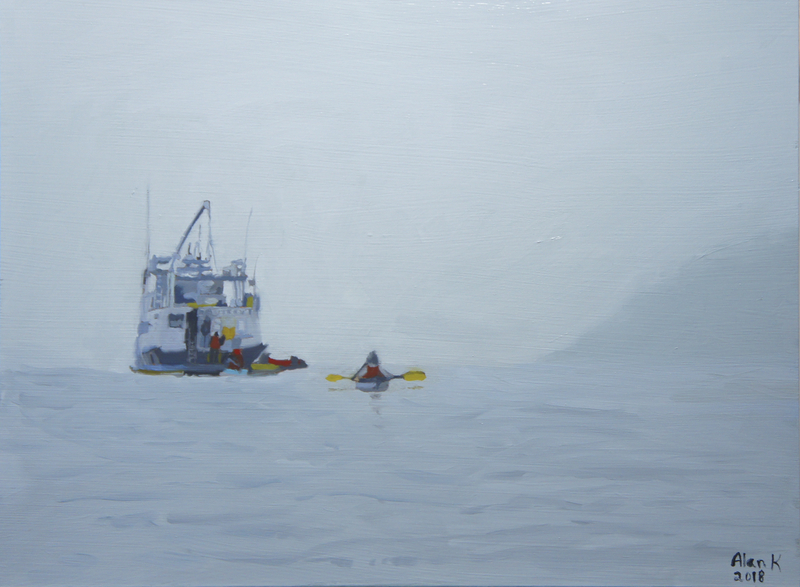 This is a painting of a photo taken on a kayaking trip north of Juneau, Alaska around 10 years ago. We were on a very small mother boat . Small groups set off early each morning kayaking along the coast looking for wildlife. It was often overcast and drizzly but the scenery was so spectacular it didn't matter. This is a painting of kayakers coming "home" at the end of a long, particularly foggy day. The sea was not quite as choppy as shown but I like this better. It is on a 9 x 12 Artefex panel. After priming with Rustoleum, an underlayer of acrylic paint was applied that more closely matched the values and color of the final layers of the mountain, air and sea. This is great. I love the way you did the water! @Kaustav, @Bobitaly , @movealonghome ; Thank you. This was more fun than my first 3 paintings. It was the first painting for me that meant something more than just a technical exercise or pretty picture that I was after. I may revisit this again with variations of composition. This painting is signed but will probably still be tweaked here and there. @movealonghome ; The streaks on the water behind the kayakers are a darker color painted on top of a wet, lighter color to suggest waves. Is that where you are looking? I would like to learn how to use an underlayer to deliberately show through but that didn't really happen here. With the dark, Geneva base, when I painted a lighter color over it, unless a thick amount of paint was applied, the darker base color would sometimes show through. That problem was solved for me by applying an underpainting that was a very rough drawing and set the values close to the final intent. With better technique, more experience and knowledge I could use the undercoat showing through to advantage. But I'm not that good . For a 4th painting I'm satisfied. It was the first painting for me that meant something more than just a technical exercise or pretty picture that I was after. You can tell! It's very good and evocative of a mood and an event taking place.